You are here: Home / Shop / All Purpose Granules / All-Purpose Granules 2 lbs. Natures Odor & Germ Control Odorless All-Purpose Granule for washing machines, trash containers, garbage disposal, carpets, and wood floors. For new, old or ongoing odor problems. 100% natural, environmentally safe and harmless to humans, pets, and plants. Eliminates odors instead of covering them up. Odors caused by smoke, pets, mildew, drains, cooking, paint, new carpets, etc. Odorless All Purpose Granule is in a two-pound shaker jar for use on many types of odors. New carpet can emit various noxious gasses (such as formaldehyde, ammonia and hydrogen sulfide) when first installed. That may be hazardous to some. Use on carpets, area rugs, bare wood or tile floors. Also, in washing machines to deodorize clothes, diaper pails, garbage disposals and ashtrays. For areas soiled by pet urine see N.O.G.C. Pet Odor Elimination Kit. 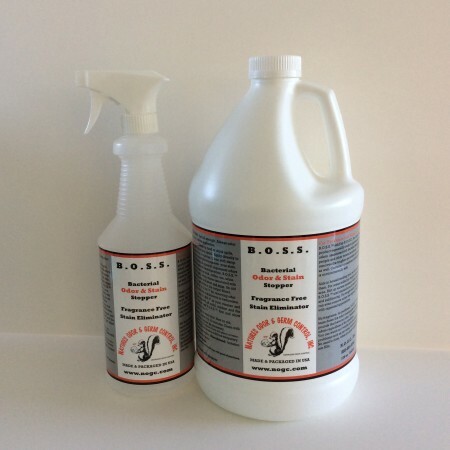 To freshen carpets apply N.O.G.C. 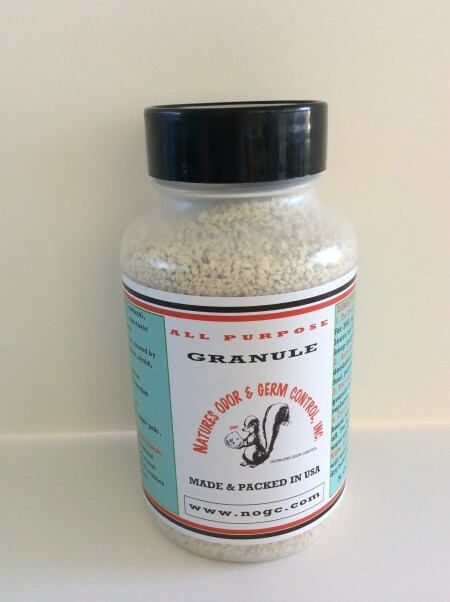 All-Purpose Granule at a rate of 32 oz. for 300 sq. ft. and leave 24 – 48 hours then vacuum; leave no longer than 7 days. Repeat as necessary to keep carpet odor free. As a laundry aid use 1/4 cup of N.O.G.C. All-Purpose Granule per load to deodorize clothes from such things as gasoline, diesel fuel, pet odors, etc. For trash containers sprinkle a few tablespoons full of N.O.G.C. 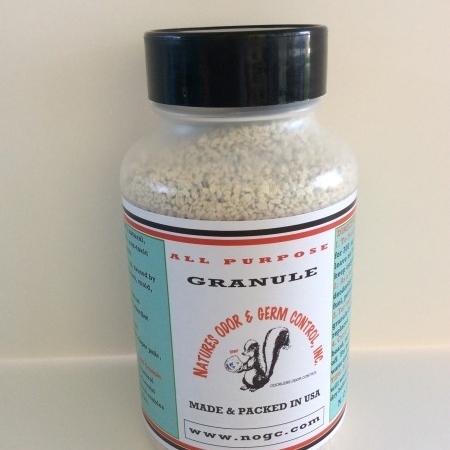 All-Purpose Granule in the bottom of the container at each bag replacement. Cut or chop onions-sprinkle a little N.O.G.C. All-Purpose Granule on cutting board, rub around and let stand 10-15 minutes, then rinse off. For hands put a little N.O.G.C. All-Purpose Granule on hands with soap and water and wash as usual. TIPS: N.O.G.C. All-Purpose Granule works best on dry surfaces but will work on wet surfaces as well. Caution: If wet always allow drying before vacuuming. 4 reviews for All-Purpose Granules 2 lbs. If I could give more stars I would. My husband recently bought a used truck. The smell was terrible inside. We tried EVERYTHING to mask the odor and try to get rid of the smell. Then we bought the N.O.G.C. products. The ones we used were the Natures Air & The all purpose granules. We used as directed and by the help of Sheryl, the smell was gone in 3 days!! I am not going to use anything else now. This is 100% effective. Thank you so much for showing us how to use the products and the great customer service. I am one happy customer. Just wanted you to know that the NOGC products are fantastic! We had an infestation of mice in the RV over the winter and the odor in the coach was overpowering and rendered the motorhome unusable. I called NOGC, not knowing really what the company was about other than it was listed under “pest control.” This was after calling several other pest control companies and being told that there really wasn’t much that could be done other than airing it out. When I talked to you, you said that indeed there was a great deal more that could be done and described the products I should order and how to correctly use them. The mice had taken up residence in the basement of the coach mostly under the shower stall. Needless to say, it was very difficult to get into, but my husband did, and pulled out a dozen dead mice. He also trapped two live ones. He found three more dead mice under the water tanks–another difficult place to reach. We administered All Purpose Granule and All Purpose Foot Powder mix together and within 24 hours the odor was nearly gone. By the end of the second day, all the odor was gone and the coach is again usable and has no unpleasant odors of any kind. It is amazing and we still can hardly believe it. So, I thank you so very much for your assistance and for the wonderful products that you sell. This year has been an especially bad year for us regarding fleas. I tried to rid my cats of fleas by using a chemical that you apply to the back of their neck. I was devastated when they both became ill and began losing their hair due to that chemical. I wasn’t sure what else to do for them at that point, because I didn’t want to make them more ill. Now, not only were the fleas still there, but they had also spread into the house. On top of that, my husband, daughter, and granddaughter are all allergic to them. I kept trying different natural products, but didn’t have any luck. After a lot of frustration and even more money spent, I still had the problem. Finally, I came across Natures Odor Germ Control products. I spoke with Sheryl Lobdell and asked her for something to help diminish our flea problem. She was very knowledgeable and extremely helpful! I purchased the All Purpose Pet Powder and also the All Purpose Carpet Granules. I spread the Carpet Granules in each room of my house and left them there for seven days, and then vacuumed them up. Then in a day or two I spread them again and let them set for another three days before vacuuming it up. In addition, I bathed and powdered the cats with the Pet Powder. And now….no more fleas!!!! Thank you, Sheryl for your willingness to help and for your support. We are extremely grateful.